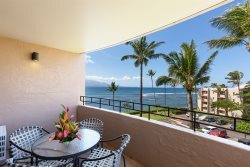 Very, Very Nice...MAUI OCEAN & MOUNTAIN VIEW DELUXE 2 BEDROOM 2 BATH CONDO RETREAT(sleeps 4) AT THE ISLAND SANDS RESORT OCEANFRONT a short stroll to the longest beach on Maui! 'HALE HO'OKIPA' home of hospitality! A PLACE YOU WILL FONDLY REMEMBER AND YOUR MAUI DREAM COME TRUE! A peaceful view of the breathtaking Maalaea Bay and palm trees swaying with the tropical breeze! Relax and enjoy the very best we have to offer... Soothing sights & sounds of the ocean from your living room, master bedroom and lanai. Convenient elevator to the 5th floor. Master California King size bed with private lanai and privacy divider between living room and master. Guest room with two twin size beds (can be put together to make a king) and own private bath with tub/showr. Washer & dryer, air conditioning, free wireless Internet, dvd, cable, free calls to U.S. & Canada, comfy modern decor, a more than well stocked kitchen, upgraded towels and sheets, large shady private lanai off of the living room. Pool, bbq, pool side lounges, beach chairs, beach umbrella, beach towels, binoculars for whale watching, cooler for your excursions, free on site parking and your very own personal concierge! Great property, centrally located. We booked this property last minute, since we had to reschedule our previous condo due to the hurricane. It did not disappoint, it was very clean, had a great view of the bay and was centrally located to Kiehi and Kaanapali. The pool is smaller than some other places but we didn't have a problem, it served the purpose and we saw many families with young kids enjoying it just fine. The highlight for us was the turtles swimming right in the ocean outside of our condo, you could see them in the waves and poke their heads up to get air, and they even came up to beach every night (so cool!). Thank you for a great vacation, we would stay here again for sure! Homey Place. My friends and I enjoyed our Maui vacation. This place provided us a home away from home. The place was very homey, clean and provided all the ameneties we needed. Most importantly, it was in a good location. We are looking forward to another Maui vacation. We will come back and stay here again. Lastly, it has a very spectacular view of Maui. Relaxing, great location. Good location between Kehei and Lahaina. Nice beach just a small walk down the road. Paradise. The property managers were responsive and professional The condo was clean and nice, great views on the balcony. The pool, grounds and grills were well maintained and clean. Lots of space, nice views, well furnished, windy, but great location! This is a wonderful little condo. My husband and I stayed here with our two little kids (1 and 3). It is so nice to have a bedroom for the kids and a kitchen to make most meals. Dining out is delicious and fun but expensive, so making our own food was great. Beautiful view off the lanai, which is nicely sheltered from the wind. We had coffees out there every morning, and Coronas in the evenings! Satellite TV and fast wifi were great for the kids (and us) too. Laundry in suite meant we went home with a suitcase full of clean clothes, unpacking has never been easier! Really no complaints about this place. The location on the island, although windy, was so handy for exploring. We rented a car and drove everywhere. 20 minutes to Lahaina, 15 minutes to the Safeway in Kihei, you are so central, and 15 minutes from the Kahului airport as well. Would absolutely stay here again in a heartbeat. Enjoyable and Relaxing Great central location with easy access to all island locations by car. Neighbours are friendly and whale watching from the lanai over morning coffee was a great start to the day. Great condo, great location We really enjoyed our stay. Condo had everything we needed. Location is great, very centralized. Would stay here again.